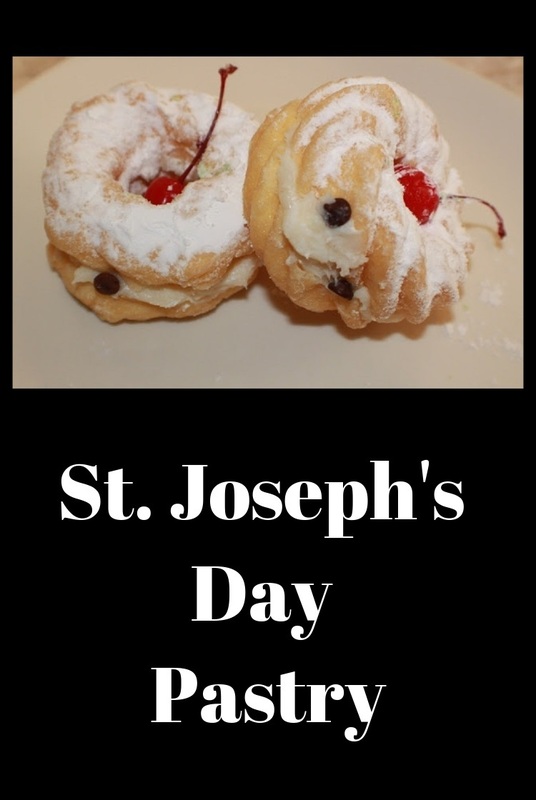 St. Joseph's Day is celebrated by making Baked Filled Pastries and Zeppole. Those are just some of the special fritters, fried doughs, or donuts, made in expectations to celebrate The Feast of St. Joseph. Here is just a few recipes to carry on this Neapolitan tradition in this recipe post today. While relatively unknown to the non-Italian U.S. population, one city that widely celebrates this feast day in New Orleans. Louisiana used to be a popular arrival port for Sicilians and at one point, the now French Quarters were known as “Little Palermo.” Celebrations occur, even to this day, with traditional foods and festivities. Mom would remind us that we need to wear red that day for St. Joseph, the patron saint of Sicily and we all did as they still do in the parades. There are several recipes that vary by years past and present that carry many names throughout the Regions of Italy and America. Here are a few we have made and loved through the years in our Italian family to celebrate St. Joseph's Day. Just scroll down to the recipe card to print off the recipes. San Guiseppe is the day for zeppole. 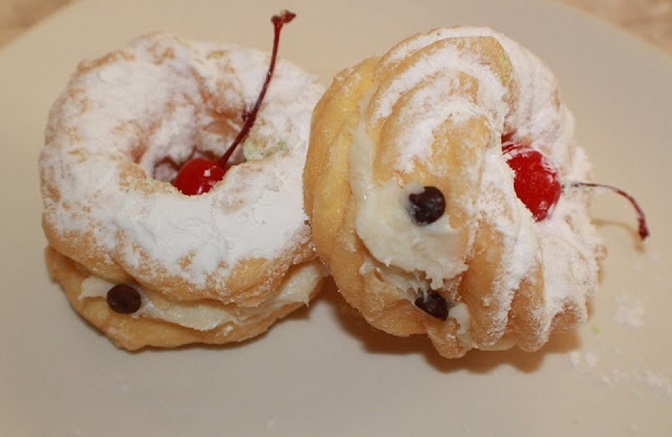 The pastry shops and friggitorie (fried food stands) churn them out in astonishing quantity, for eating Zeppole on the 19th is another of those traditions in Italy that must be observed. Despite their size, everyone eats at least two or three, or even four, because the sweet, delicate pasta bigné, flavored with a hint of cream and one or two bits of candied cherry, is so good and creamy delight. 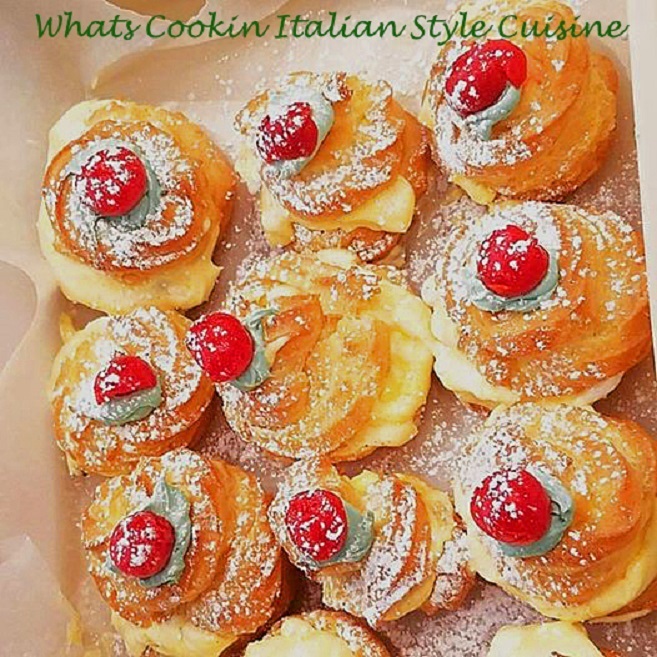 The current, refined version of zeppole became a tradition quite late, perhaps towards the end of the 19th century. Among the (older) cookbooks called, "Tortanetti di pasta bigné" (1865) the zeppole for San Giuseppe are instead made from a flour-and-water dough that's fried, and dusted with sugar and powdered cinnamon or dipped in honey. 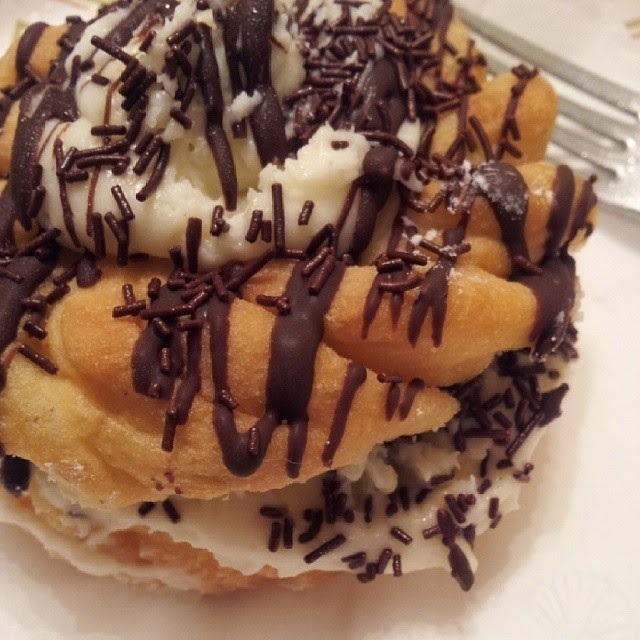 The photo above is the "Cafe Cream Style" St. Joseph's Day Pastry, you will find in many Italian American Bakeries. The dough is made on top of the stove in a pan with flour, butter, eggs. See recipe below in the recipe card. I use a freezer bag with a large star metal pastry tip to add the swirls on the dough. That is a great tip and time saver for making each puff the same size also. After putting the star tip into the freezer bag, cut just a small piece at the star tip to release the dough. I do that straight onto a Silpat mat. Now they are ready for the oven. Cafe cream (see recipes below in the recipe card) is next to make while these are baking. The cream is smooth and thick like a custard. Adding the ricotta makes it super creamy and delicious. It's known that this traditional version was quite ancient. There are so many different versions to celebrate and make the pastries for St. Joseph's Day. Traditionally they are a light dough filled with cream. We make fried pizza dough also referred to as "Zeppole", very often here in America. You will find at many Italian feasts, fried dough is all homemade pizza dough shaken in sugar. The pastries were well known that on March 19th they were made by the ton in a pastry shop in a frying stall, as well as at home. Guests and whoever else happened to come by were given a pastry if you were really lucky to celebrate that day and were named Giuseppe (Joseph). I really love the traditions. Everyone makes them different, that's why I will give you several versions of the recipe. 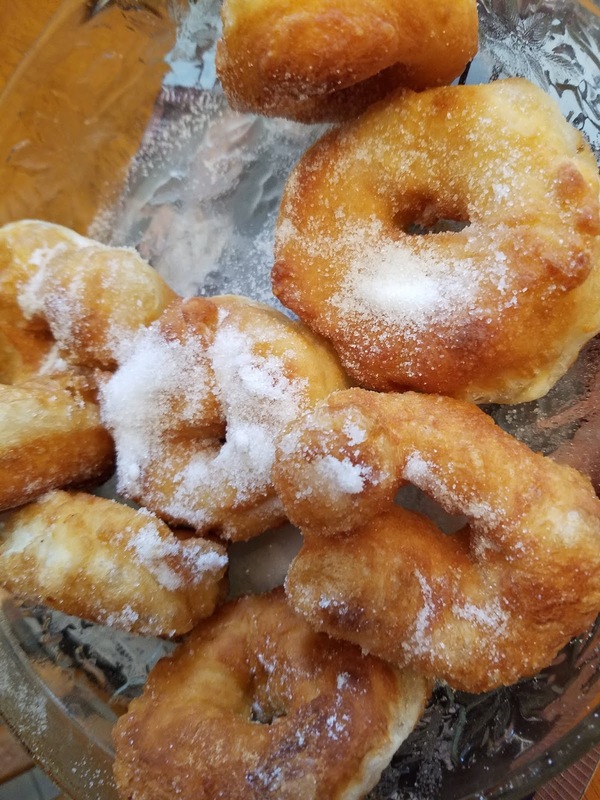 Some Regions celebrate with a fried dough or zeppole with sugar, powdered sugar or even added cinnamon sugar. It depends on where and who came up with a new version. All of them are a wonderful delight no matter which Region makes them and we continue to enjoy all the different kinds. The Feast of St. Joseph is a big deal in Italy. St. Joseph, who is the patron saint of the family, is celebrated at the Spring equinox and his day is a feast of bread. At one time, the Feast of San Giuseppe, as he is called in Italy, was an Italian national holiday. St. Joseph's feast day is still celebrated with families gathering together to create enormous buffets for neighbors and friends. The table is said to overflow with an abundance of food that the Father of the Holy Family provides. The centerpiece of St. Joseph's Day festivities is an altar laid with fine linens and decorated with flowers and decorative bread. In America, the festival is like a giant potluck dinner, but the dishes served are similar to those eaten in Italy and are always meatless. Some of the foods you will find are fried fish croquettes, sardines, calamari, and shrimp on top of pasta with anchovies and breadcrumbs, stuffed artichokes, spring vegetable frittatas, and soup called minestrone. In America, as in Italy, the highlight of this meal is the special sweet desserts that are prepared. Although the names and shapes of these baked, fried or hot delicate fritters, can differ from Region to Region, they are as much associated with St. Joseph's Day as turkey is to Thanksgiving. 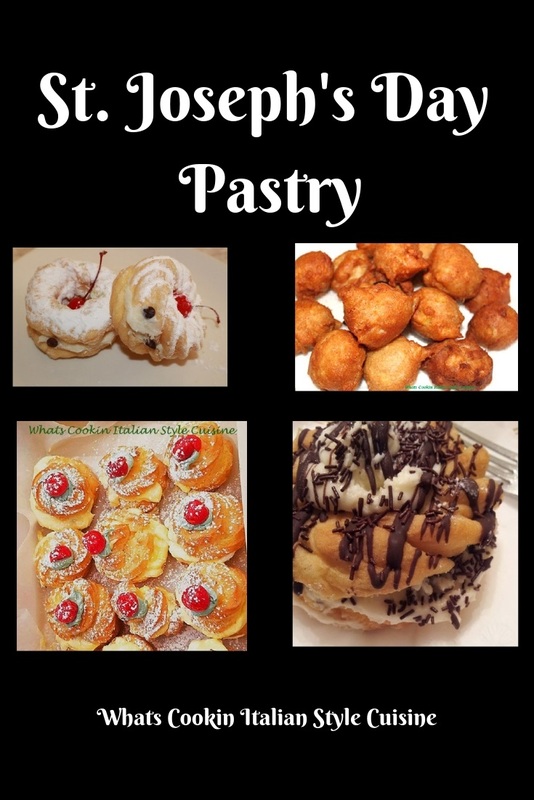 They are usually called zeppole or frittelle; other names are cassatedde, sfinci, bigne and St. Joseph's Day Pastries. The pastries may be fried or baked and are sometimes filled with sweetened ricotta, pastry cream, or custard. In some areas, the zeppole are made of rice while in others they are based on flour. Not only does the holiday commemorate the putative father of Jesus and patron saint of carpenters, but it also is a celebration of all fathers, Italy’s version of Father’s Day and of spring’s long-awaited return. This is a summary of how Italy and different Regions celebrate with St. Joseph's Day pastry. Each Region celebrates with pastry. Check out some of these delicious recipes. Beat eggs in a bowl set aside. Measure 1 cup flour and set aside. In a heavy nonstick saucepan, pour 1 cup water and a stick of butter (not margarine) add zests and bring to a boil on medium heat, leave on heat and add flour stirring quickly with a wooden spoon until flour is dissolved and comes together. 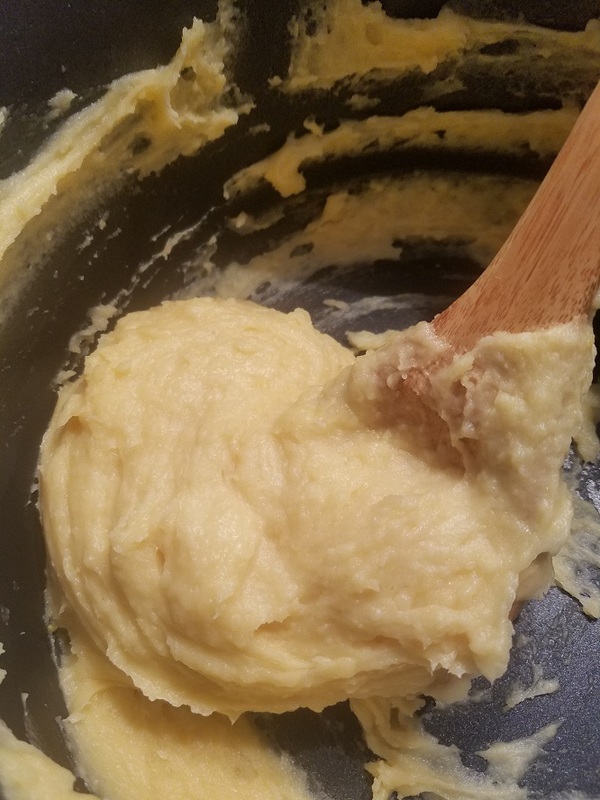 Remove from heat, add eggs and beat very rapidly with the wooden spoon until a ball of dough is formed...Note it's very important to beat this fast. Spoon one tablespoon of dough or teaspoon for small puffs on an ungreased cookie sheet. Shape into logs for eclairs or round for cream puffs. 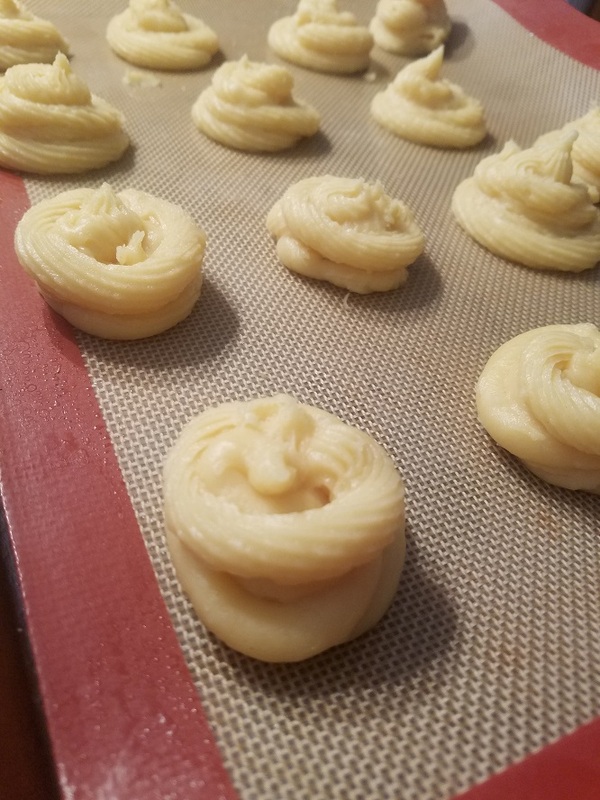 (Shown in photo, I used an extra large cookie press star-shaped tip to make the swirled puffs after baking filled with cafe cream recipe below). Bake on 400 for 1/2 hour, do not open oven or puffs will not cook correctly. When browned remove from oven, cool, cut in half to fill. Combine all ingredients except chips and beat with electric mixer about 10 minutes. Fold in chocolate chips. Chill in refrigerator until ready to use. In a small heavyweight saucepan, beat the yolks, sugar, salt, and flour all at once until all lumps are gone. Slowly add milk and whisk to make a smooth consistency. Heat slowly over medium heat till this mixture thickens stirring constantly. At the very start, whisk slowly and then a little quicker as the cream starts feeling thicker. Wait for a simmering boil to appear. At this point lower the heat to very low as you finish getting the perfect creamy consistency. As the whisk leaves a trail as it stirs, this is the indication that the cream is ready. When the pudding has thickened remove from stove and cover with wax paper not to form a skin. Refrigerate overnight or at least 4 hours. You will be adding the Ricotta filling to this pudding after it has chilled. In a bowl add ricotta, sugar and almond flavoring, stir till completely mixed. Fold in the pudding. Fill cream puffs. Keep refrigerated. These also look nice with a mixture of powdered sugar and water glaze with a cherry on top. In a large bowl, combine the ricotta and eggs, and whisk until smooth. Add the flour, sugar, baking powder, and salt; whisk to make a smooth batter. Fill a wide and shallow skillet pan with about 3/4- inch of the oil. Heat over medium-high heat until a bit of test batter sizzles when dropped in. Cook in batches, dropping 5 or 6 rounded teaspoons of batter into the pan at a time. flip and fry for 1 more minute, or until golden brown. 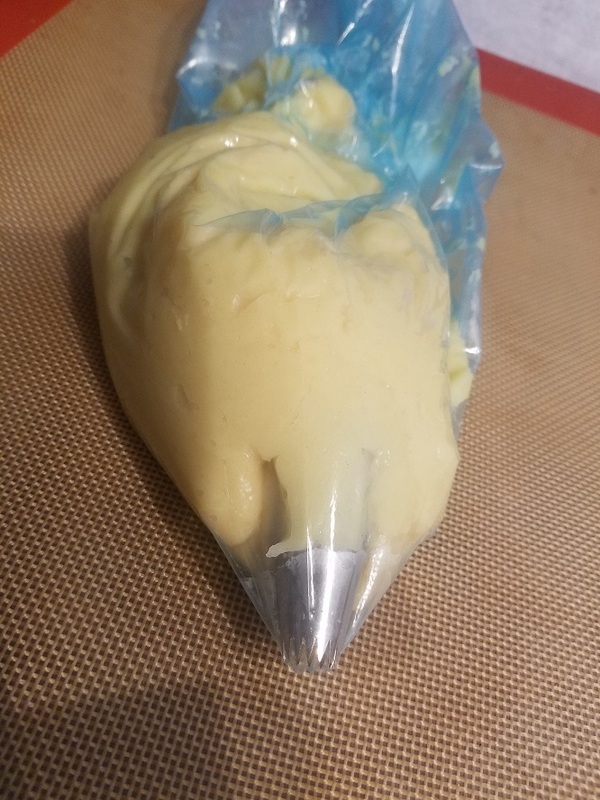 Transfer the ricotta balls to a plate with some paper towels just to remove the excess oil, and continue cooking the rest of the batter until all is used. On a serving plate, pile the ricotta balls in a rough pyramid. Using a sieve, evenly and generously sprinkle the powdered sugar, regular white sugar or drizzle with honey. Add the 1/2 cup sugar and cinnamon and stir to combine. Set aside. In a medium saucepan combine the butter, salt, 3 tablespoons of sugar, and water over medium heat. Bring to a boil. Take the pan off the heat and stir in the flour. Return pan to the heat and stir continuously until mixture forms a ball, about 3 to 5 minutes. Transfer the flour mixture to a medium bowl. 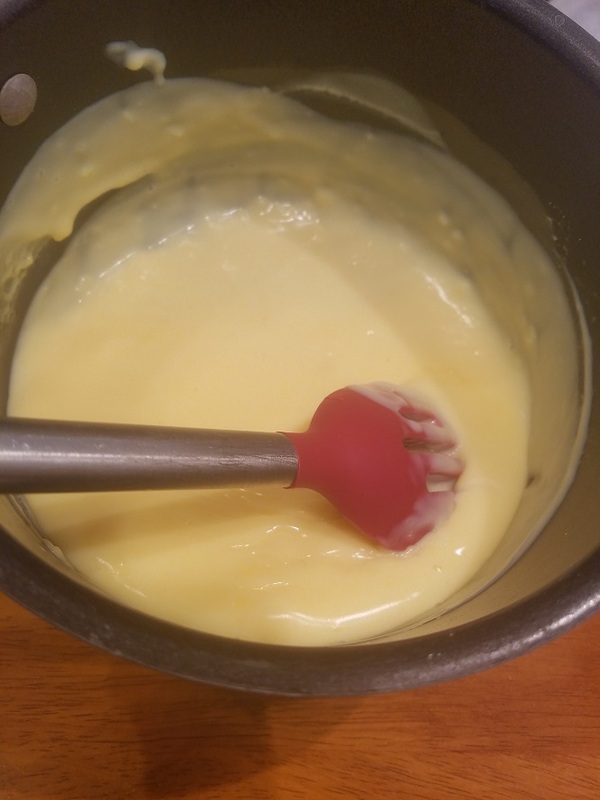 Using an electric hand mixer on low speed, add eggs, 1 at a time, incorporating each egg completely before adding the next. Beat until smooth. If not frying immediately, cover with plastic wrap and reserve in the refrigerator. Meanwhile, pour enough oil into a large frying pan to reach a depth of 2 inches. Heat the oil over medium heat until a deep-fry thermometer registers 375 degrees. Using a large tablespoon carefully drop about a tablespoon of the dough into the hot olive oil, frying in batches. Turn the zeppole once or twice, cooking until golden and puffed up about 5 minutes. Drain on paper towels. Toss with cinnamon-sugar. Arrange on a platter and serve immediately. Another Option: Powdered Sugar or granulated sugar to toss them in after frying. Sounds a lot like my mom's cream puff dough! These sound terrific!